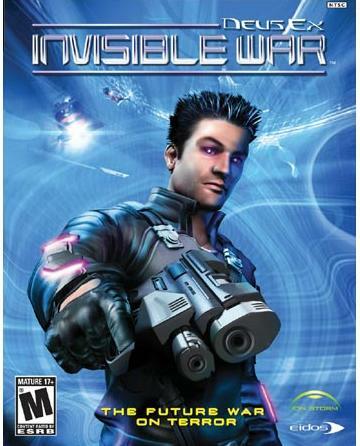 There are only a couple things that kept Deus Ex: Invisible War from getting a perfect score. The first was character development. As I played through this game I never felt any connection to the other characters in the game. In the first Deus Ex Paul and the kid on the comms (I forget his name) played a big role and I always felt like I had a companion. This game had three characters that I think I was supposed to feel for but most of them left me feeling ambiguous. Actually, there was one character that I absolutely loved—The NG Resonance AI. I ended up scouring new areas looking for NG. The part that sold me was the extended conversation with the first AI that you meet, where my character tried to trick the AI. It was funny and very well done. Later when you meet the real NG I was very let down but it was done in a way that made it obvious that I was supposed to be. That still didn’t make me feel any better about it. Ion Storm could have made me feel bonded to the three other characters from the academy by having some sort of prelude mission before the academy is attacked. Going through some sort of mission with them right in the beginning (like you do later on) would have made all the difference in the world to me. Just saying “hi” to them didn’t make me feel like we had this lifelong bond, and therefore I just didn’t care about them. Even the one that I supposedly already knew didn’t make much of an impression on me. The other aspect where the game fell short was on the technical side. I didn’t mind the weird physics, and I didn’t mind the universal weapon ammo too much, and the inventory wasn’t as bad as I was expecting... Where the new ideas fell flat however, were with the weapon mod system. The new system lets you apply two mods to any weapon after which you must discard it and find a fresh weapon if you want to something new. I really, really, really missed the weapon mod system from Deus Ex which allowed you to upgrade your weapon more and more by applying mods to it multiple times. By the time I got to the part in Deus Ex where you get captured I had built up my two favorite guns into formidable weapons. I was very scared that I wasn’t going to get my gun back—I had developed a bond with it. And I was very excited to find the weapons depot and get my custom pistol and sniper rifle back. That was a memorable experience in the first game, but in the second the weapons were throw-away. At the end of the game I had countless weapon customizations that I had no intention of using, having maxed out my weapons about three hours into the game. I felt no connection to my gun, and really missed that part of it. It is the same story with the biomods, I ended up with tons of them at the end and no intention of using them. Going back to the universal ammo real quick: I’ve already mentioned above that it didn’t bother me too much, but I did notice that it has a severe downside. When using a weapon that guzzles ammo like the flame-thrower (or even the sniper rifle), if you get stuck in a fire-fight and your ammo runs out you are totally screwed, because you can’t switch back to a wimpier gun and continue the fight—your ammo is totally gone. This made the flame thrower and other big guns rather useless to me. And I admit to missing the Deus Ex inventory. I kind of liked that mini game of shuffling things around to get them to fit. I was excited in the first game to get the telescoping baton because it worked like the crowbar but took up less room in the inventory. In Invisible War, there’s no benefit at all to using the baton over the crowbar. I can see that being a distraction to some players, but I personally found it neat—kind of like a game within a game. I realize this whole review sounds like I didn’t like the game, but my overall impression of this game is still very high. It just isn’t the absolute knock-you-down-amazing game that Deus Ex was. It’s like they just didn’t get a chance to balance the game before their shipping deadline. Too bad, it could have been a great, great game!